Shoulder bag made of eco-leather with two eco-leather handles and two golden chain handles, hammered calf print, visible logo, dust bag. Handbag made of eco-leather with two handles, hammered calf print, removable shoulder strap, visible logo, dust bag. 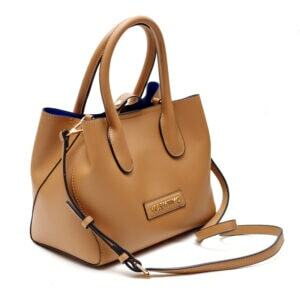 Handbag made of eco-leather with two handles, removable shoulder strap, visible logo, dust bag.